I know most of you have knowledge about this , but i want to share my blog may it will help you more regarding this in very easiest way and more user friendly. In my blog , i will do the task in 3 steps basically. In first step,** i will go through the requirement and create a basic html for our requirement**. In second step, i will show you and describe you most about the java script for our objective. In third step ,** i will show the output and the complete code for this**. 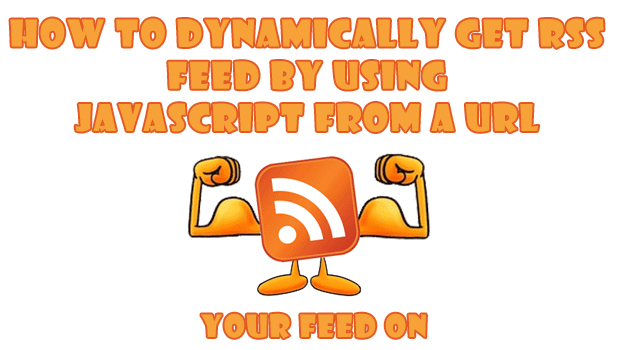 Let’s First create a basic html for this, as per our requirement we need 2 text boxes which represents respectively “Feed URL” , which takes input of rss feed url and the second text box html element will take “Number of Feed to Fetch”. Once , we create both of the text box element , i will create an event handler element by name button html element , which will perform the action when both of the inputs are available , by checking validation for both of the fields when click on button. So, i am writing the result oriented html below , which will included in above html , in div element by class name example. Did you get all the points and requirement defiend in Step-1, if you are ok will this , than i will now move to step-2 , where i will write the js code for the above. Step-2: will show you and describe you most about the java script for our objective. In step-2 , we will discuss how i will perform validation before getting rss feed and how i will get rss feed , if validation are successfully completed on button click event and calling getFeed method as defined in html in step-1. // get the value of number of Feed to fetch. number of feed to fetch and callback function in return and context as the div element where to place the result. // let’s look about rssReader init function and parse the resultant data to the post result element and show. “the element where we have to show the required result”. and append it, after append we hide the loading feed image which was loaded earlier on button click until we didn’t get the result, as we got the result, we will hide this element. Now , i would like to move to step-3 , where i will show you the complete code for this with output. step-3 : will show the output and the complete code for this. So , all of this i have done here to complete the requirement, i hope you all got very well my blog, if you got any question regarding this, you can send me comments on this or if you like my post you can also share me your valuable feedback. Please check the complete source code by clicking the below button or to download.